Friday afternoon and evening was a good jam session practice with both Speed Trials and Slopestyle . 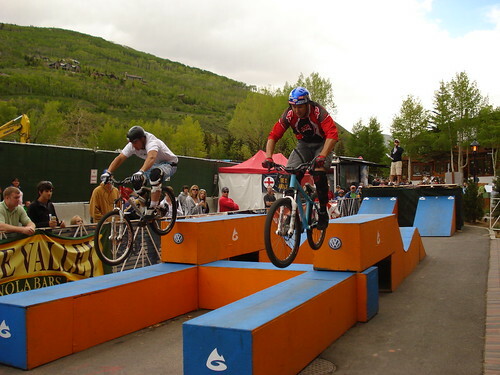 Lenosky designed the sspeed trials and Kyle Ebbett did the slopestyle both are really good and is going to be real fun. Riders here are Ebbett , Lenosky , Strait , Korba .T-Mac ,Andrew Taylor , A-Rev , Ryan Howard , Kyle Jamison , Jamie Goldman,Joe P , George Ryan , Nate Adams , Emeily , Lisa and Tammy were killing the Slopestyle course tonight ,Team Dino in full effect E.Porter hurt his ankle again so he probabaly will not be riding. all is good had a imprompt 2 BBT Friday since I ain’t at the trails .One thing is for certain we all all having a blast here .Good Friends good riding and good alcholwhat can be better than that..For more info go to www.tevamountaingames.com. Sorry for no pic but I am using the computer in the lobby for an update..